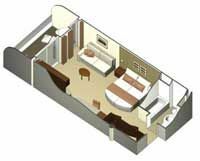 ACCOMMODATION: A huge range of superbly appointed suite, family, and stateroom choices, with at least 75% having their own private balcony. LAWN CLUB & POOLS: Jacuzzis, outdoor pools, indoor adults-only Solarium, and half an acre of real grass lawn on the top deck for games and concerts. ENTERTAINMENT: From Broadway-style theatre to cutting-edge circus shows, comedy, magic, dance and live music – the best entertainment at sea. CHILDREN’S’ CLUBS: Four different age groups of fun-filled activities, Xbox games and more, supervised by experienced by experienced youth staff members. PORT IMMERSION: Onboard Destination Concierge for advice and bookings, interactive TV shore excursion programming and talks by destination experts. The party and cruise capital of the word, Miami is a bright, brash, playground city that 15.5 million tourists flock to every year. Being the gateway to the Caribbean and Latin America, Miami has a large Cuban presence, evident in the vibrant neighbourhood of Little Havana. St. Croix is the largest and most remote of the three inhabited Virgin Islands, covered in forested hills, fertile lowlands and surrounded by coral reefs providing excellent diving opportunities, particularly along the north coast. Along with its picturesque beaches and superb diving, St Croix has a variety of indoor and outdoor activities, including hiking, historic sights and attractions, golf and horse riding. There are fine hotels, excellent dining and casinos. The skyline of St. John’s, the capital and largest city of Antigua and Barbuda, is dominated by the magnificently evocative white baroque towers of St. John’s Cathedral. The towers are the first sight of Antigua for about half of the island’s visitors each year, many of whom arrive by boat. With its recently completed cruise ship dock and several hotels, St. John’s is a lively hub for shopping and dining. On Friday and Saturday mornings, be sure to visit the vibrant farmers market on the southern edge of the city. Folk crafts, colorful tropical fruits, and a buzzing crowd make for a lively morning. Bridgetown, originally called ‘Indian Bridge’, is the capital and commercial centre of Barbados, with about 80,000 inhabitants. It is a busy port with a natural harbor inlet, known as the Careenage, and is well utilized by pleasure craft and fishing boats. Tourists in Bridgetown will find much to see and do: A range of duty-free shops near the harbor sell staples like Mount Gay Rum, while more colorful shopping options include the Cheapside Market and the Swan Street pedestrian mall. Local restaurants in the Careenage serve up fresh lobster and fish with Caribbean flair. The main reason for the existence of the town of Castries, capital of St Lucia, is as a port of call for hundreds of cruise ships that dock in the deep harbour every year, disgorging thousands of day-trippers who shop till they drop in the market and duty-free shopping malls. Visitors who linger find the town has a certain charm surrounded by hills, although little to offer in the way of sightseeing or architectural heritage. There is a very vibrant and colorful market on the go every day except Sunday, some good waterfront restaurants and a few remains of the defenses of the island’s various occupiers to claim the attention. Castries also serves as a good base for island exploration, whether it is by road or water. Philipsburg is the capital of Dutch St Maarten and the only town of consequence on the island. It has two main streets, Front Street (Voorstraat) and Back Street (Achterstraat), connected by several bustling thoroughfares, and filled mainly with duty-free shops, cafes, hotels and courtyards overflowing with flowers. When you stay in one of our Penthouse Suites, you’ll enjoy the luxury of European-style butler service. This includes assistance with unpacking and packing. In-suite lunch and dinner service. Afternoon tea. Evening hors d’oeuvres and complimentary in-suite espresso and cappuccino from Café al Bacio. 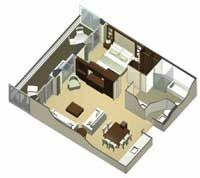 We’re sure you will be more than happy with the grandeur and scale of the space, along with all the amenities, like the butler’s pantry and two interactive audio/visual entertainment systems. These spacious, accessible suites transform a cruise vacation into a completely indulgent experience. You’ll enjoy special privileges and an extensive list of amenities including European-style butler service twenty-four hours a day. 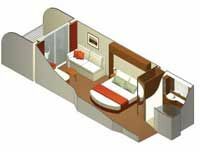 These are some of our most desirable locations—found at the aft of the ship with a similar layout to AquaClass® Staterooms. Spacious accommodations complete with special privileges like priority check-in, personalized Concierge service, priority seating time preferences in the main dining room and specialty restaurants, upgraded room service menu, evening hors d’oeuvres, plush Frette® bathrobes, and veranda with lounge seating. 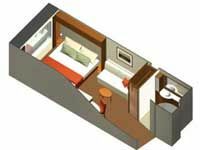 These accessible staterooms have the same layout as AquaClass staterooms. Floor to ceiling veranda doors maximize your view of the sea. 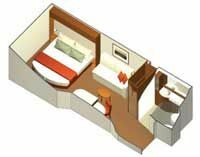 Accessible staterooms with ample living space, including a sitting area and a flat screen TV. 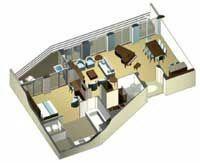 The accessible AquaClass® staterooms offer a tranquil retreat and provide unlimited access to many of the AquaSpa® amenities. Enjoy an amazing array of flavors and a wide selection of restaurants to suit every mood. Celebrity Cruises® menus are inspired by, and sourced from, the incredible regions we visit. Sushi on Five- Modern luxury take on traditional Japanese fare. AquaSpa Café- Fresh, spa-inspired delights to nourish body and mind. Oceanview Café- Café’s décor and offerings reflects an international marketplace. 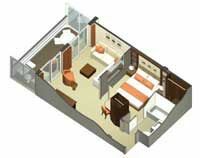 Relax and dine in the private comfort of your stateroom. Each of Celebrity Cruises® clubs, bars and lounges is a unique destination unto itself, with menus offering a diverse selection of classics to complement the latest trends. Some also reflect the regions we visit. To keep their menus dynamic and fresh, Celebrity Cruises® work with a variety of sources including mixologists from the brands served and creative staff. *Restrictions Apply. Information and pricing is subject to change without notice. While we do our very best to ensure that information and pricing appearing in this website is complete and accurate, we cannot be responsible for incomplete and inaccurate representations, which may or may not be under our control. In the event of a pricing error, misrepresentation or omission, we reserve the right to adjust the pricing or make any other corrections.